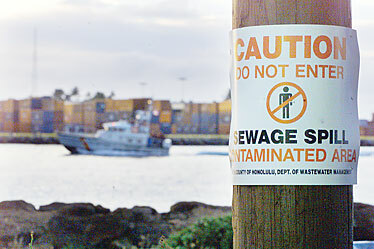 Signs were posted around Sand Island Recreational Area in 2004 following a sewage spill. The city was responsible for 297 sewage spills that could have potentially endangered the public's welfare, according to a federal judge's ruling this week that puts an end to a four-year lawsuit by several environmental groups. Judge David Ezra has yet to rule on the penalty the city will have to pay for each violation, which could total into the hundreds of millions of dollars. But Ezra has said he does not want city taxpayer dollars to go to the federal government and would like to see it go toward fixing the city's aging sewer systems. In a 46-page ruling Monday, Ezra said the city had violated the federal Clean Water Act 149 times and broken federal permits for its wastewater treatment systems 148 times by allowing sewage to spill into Hawaii's waters dating back to 1999. Several environmental groups — the Hawaii chapter of the Sierra Club, Hawaii's Thousand Friends and Our Children's Earth Foundation — sued the city in 2004, contending that the city had failed to manage its waste-water treatment system properly by using thousands of sewage spills since 1999 as examples. "For years, we have been trying to convince the city to listen to our concerns and take the steps necessary to fix the aging sewage infrastructure," Donna Wong, executive director of Hawaii's Thousands Friends, said in a news release yesterday. "We appreciate the court's careful attention to this matter. We hope the city will now step up its efforts and take our concerns into consideration." Eric Takamura, city Environmental Services director, pointed out in a written statement yesterday afternoon that the groups originally claimed 539 violations, many of which he said were as small as one-half gallon and some that had no impact on Hawaii's waters. "While we continue to improve the performance of our waste-water system, and spills have declined dramatically, we have always accepted full responsibility for spills from our wastewater system," Takamura said. "The city is devoting unprecedented attention and resources to a wastewater system ... Our residents are paying for this in their sewer fees. They should not have to bear the additional costs of defending against this lawsuit." In the lawsuit, the groups said the city had violated the Clean Water Act for discharging raw or partially treated sewage into the ground from its Honouliuli Wastewater Treatment Plant. The groups had also said the city violated its permits by diverting the untreated sewage from the waste-water treatment plants. Ezra had dismissed some violations and the groups had dropped some after the city argued that some spills didn't enter any waters that could harm the public, such as enclosed streams. The city had also argued that some spills were counted twice.